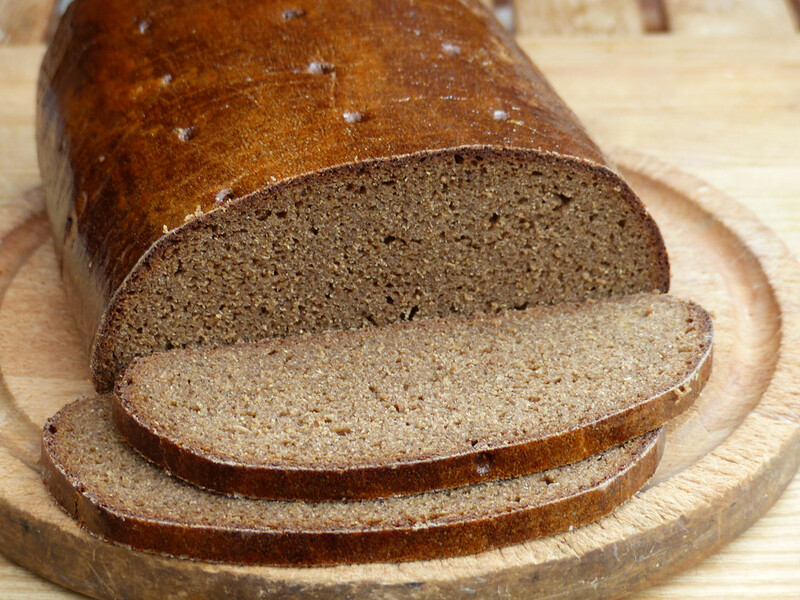 I have a nostalgic childhood memory of a black or near black bread that used to appear on the table at family get togethers in the East End of London just before and after the war. Once in a while that memory returns strongly enough to encourage me to start yet another futile unsuccessful search to discover what this exotic bread was…….. futile that is until last month when I came across This video on YouTube under the name rus brot. It is in Russian with English subtitles and it was the opening shot of the finished loaf which stirred those old memories. However I was surprised to see that the bread was actually Borodinsky bread created using a 1940 recipe, a bread I am familiar with from other recipes and from Stanley Ginsberg’s “The Rye Baker”, but always shown as a tinned loaf and a rather lighter colour. None of those had previously given me that Eureka moment that said “this is it”. So of course I had to bake one for myself. It is quite a complex recipe requiring a two stage levain build, a scald which has to be kept at 63-65°C for five hours, a pre dough and a final dough mix but my first problem was getting hold of the 50g of red rye malt flour called for in the recipe, which as others have found is rarer than hens’ teeth. But I happen to have some rye grain and my new toy, a Mockmill 100, so how difficult could it be to malt it myself? A quick search on this site resulted in an entry from dabrownman dated March 2012 which gives the method complete with ample photographs, so thank you for that Dab. After that I just followed the recipe using my own milled rye flour and Marriages Strong white instead of the 150g of first clear wheat flour called for which is unobtainable in the UK (unless someone tells me otherwise) and here is the result. It is quite delicious although not quite as open crumbed as I would like even for a wholegrain rye loaf. So having had my “Eureka” moment the doubts are starting to set in. I have now seen other loaves on the rus brot channel which might also have qualified as my childhood black bread and my own attempt turned out to be more mahogany than black so if anyone out there can suggest or guess at what bread might have been baked and sold to the largely Jewish immigrant families of London’s East end before, during and after the second world war I would be more than pleased to hear. Sorry about the belated response. I have been away from home for a few days staying at a place where internet access is a dream for the future. 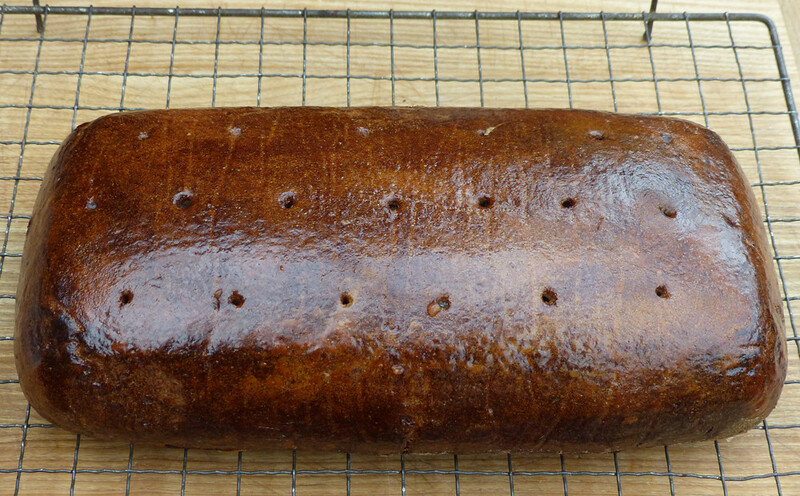 Back now so thank you for your suggestions for a darker rye loaf and video of your westphalian pumpernickel bake which is now on my ever longer to do list, but my search over many years has really been to discover the exact loaf that the family used to enjoy so long ago. Although I can recall how it used to look I have no memory of the taste, apart from delicious. The 1940 version of the Borodinsky on the YouTube rus brot site certainly looks like the real deal and I will try again to produce a darker version, but unless I come across a 100 year old baker who just happens to have worked in the Whitechapel area of East London back in the 1940's in his younger days, I might never know for sure. And it's my go-to rye bread recipe. Whether you have found the exact recipe you're looking for, or not, that is a mighty fine bake. Looks great! I still have a couple of ancient cousins who also remember "that black bread" and one even remembers the name of a local baker of that post war era but the name has disappeared. So the search goes on. Your loaf is beautiful! I've made this bread several times and each time the crust was different. I was only able to achieve a similar crust like yours in my first bake. I suspect the potato starch mixture might have caused the inconsistency. Could you share the ratio of potato starch to water of your mixture? I didn't record mine in the first bake as I was overwhelmed by the new procedures. Did you follow Rus Brot's baking method/temperature/timing? If not, please share. Thank you. I can't be much help about the potato starch which I had never used before. I bought a 500 gram bag from a local store which was the smallest quantity sold, mixed too much in too little water and ended up with enough thick paste to plaster the walls of my house. My wife suggested that I discard half of it and water the rest down which I did and ended up with a fairly firm but brushable paste. ( On a second viewing of the rus brot video their potato starch mix is rather more liquid than mine but I was quite pleased with the glaze I achieved ). I too was rather overwhelmed by the new procedures so I deliberately followed the Rus Brot method/temperatures etc. on this first attempt at the Brorodinsky and will feel more confident to use my own judgement in future.